Prev Spaghetti and Meatballs (Meals Kids Should Know How to Cook Before Leaving Home) Next College is Looming, But Will We Kill Each Other First? When I was a teenager, I wanted a second hole in my left earlobe. I cannot remember, now, why that was so important to me (or why it was just the one, except I think it was the style to have an extra on just one side), but as I had not even been allowed to get “regular” ear-piercing done until I turned 14, a second hole was absolutely out of the question. It wasn’t proper, and I was too young, and no. Being young and stupid, one day when I was 15 or 16, I was fooling around with an earring in the bathroom, wondering how much pressure it would actually take to shove it through my earlobe. And then… I shoved it through my earlobe. I immediately panicked (Mom is going to kill me…) and pulled it back out, but then—now that I had, you know, a puncture wound—it bled so much, I shoved the earring back in and decided to take my chances. My mother did not kill me, and (surprisingly) I didn’t die of tetanus or other infection. When I turned 18, I went out and got a third piercing on that earlobe, as well. So it may seem weird that yesterday, at the ripe old age of 44, I went out and got a tattoo. Perhaps weirder still: I went out and got a tattoo with my kid. If you are new to my writing and/or my family, you need to understand that my daughter’s 18th birthday was a tremendous landmark. Her adolescence was distinguished by years of struggle with anxiety, depression, an eating disorder, and self-harm. As with any mental illness, recovery is not a state of being; it’s an active, ongoing process. And if I’m being totally honest, there were long stretches of time where things were so bad, hope was a precious commodity and recovery felt impossible. We feared for her life, and if you’ve never been through that with someone you love, consider yourself lucky. (I write for a living and I cannot describe what it’s like to live with that fear to someone who hasn’t experienced it. It’s debilitating.) So: 18 is an arbitrary marker of “adulthood,” sure. But it is, for our family, a triumph. She didn’t just survive, she has thrived. We have grown closer and stronger as a family, and she is still working hard every day, yes, but she is also so much greater than the sum of her demons, now. She is healthy. She is successful. She is, more often than not, happy. The original plan was matching semicolon tattoos. Small, of course. Neither of us wanted something huge. But the more I thought about it, the more I realized that… I wanted something more. I wanted her tattoo to look like it came from mine, just as she once came from me. And I wanted my tattoo to have a little bit of context. So we talked about it and sketched things and yesterday I waved my hands around with the artist and we got it figured out. My daughter went first. She barely flinched. My tattoo is larger and I was… not entirely prepared for the pain, which was for the best, I think, because it meant I just dealt with it and went back to breathing normally once it was over. (Fun fact: Having needles jabbed into your skin repeatedly kind of hurts!) We got our permanent marks on the outside to reflect the changes we’ve undergone on the inside, and we did it together, on her 18th birthday. 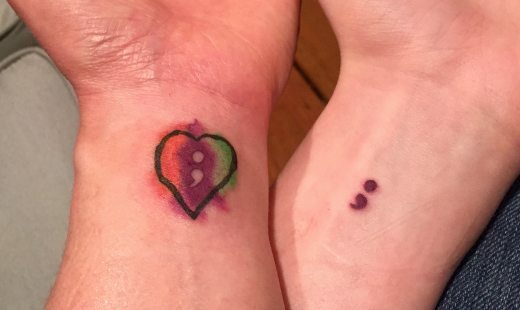 She got her semicolon, in her (and my) favorite color. I got a rough-drawn heart, overflowing with the colors of my family—purple for us girls, green for my son, orange for my husband. It’s messy, and right in the center, my daughter’s semicolon has been carved out and left me with the reflection of it. As a person who never thought I’d end up with a tattoo, it already feels like it’s a natural part of my body, the same way the people I love best are always a part of me. Her story—our story—has only just begun. Beautiful. And the way you told it made me cry. I love the semi-colon project, and I especially love your take on it. So special and meaningful! I love this so much it hurts. I love this because I followed your family through your blog through all of those difficult times. I love this because it shows, in more than one way, how much you’ve worked to support your kids in all their wonderful and difficult uniqueness. I love this so much because I hope I can be as supportive and (somewhat) flexible as my children with all their differences and difficulties move into their teen years and press up against the limits that I’ve so intensely held all these years. Oh, and happy birthday, Chickie! That is beautiful. My heart is so full for you both. I was thinking about you while we were there (does that sound creepy? I don’t mean to be creepy), my friend. I. Love. That. Tattoo. It’s beautiful!!! I am so not a tattoo person, but yours is the first time I have seen a tattoo and thought, “I would totally do that.” What a perfect tattoo for you and Chickie’s story. Happy Birthday, Chickie! I love both of them. What a beautiful way to mark a momentous occasion. I am at my desk crying silent tears. These tattoos are absolutely perfect. We are coming up on the two-year mark of my daughter’s first hospitalization for depression, anxiety, self harm, and suicidal ideation. And while she has made so much progress and amazes me regularly with her strength, I feel still feel like I can’t stop holding my breath, preparing for the next incident. Watching you and your daughter the past two years gives me hope that someday my daughter and I will be in a similar place. And we may just copy your tattoos. It takes a long time (in my experience) to trust the new normal, but you’ll get there. Lots of love to both of you! I’m not a tatoo fan, but this is beautiful. Congrats. Mir, this is one of the most beautiful things I’ve seen. I remember when you wrote about Chickie’s most difficult times, and sending things to the other girls who were hospitalized with her, and your love for her overflowing through her pain and your pain. And the triumphs she’s had as she’s gotten stronger and stronger, and had so many happy and successful days. I can’t get over how perfect those tattoos are – they flow together perfectly, and stand on their own completely. Amazing all around. Those are amazing. Tomorrow (4/20) will mark the one year anniversary of the day my daughter was released from the hospital for the second time last year for anxiety, depression, and suicidal ideations. I won’t lie…it has been a really hard year. I keep thinking that maybe once we hit a year, the second will be easier, then the third, and so on. I’ll have to go dig and see if I can find more of your story, but this one gave me hope. It does get easier. Slowly—never fast enough!—but it does. We were in the weeds for years. Have hope. What an awesome tribute – . LOVE your design, so much meaning – it’s a beautiful thing. I, too, tattood myself at 41 after my daughter survived a near fatal car accident and subsequent brain injury. It’s a phoenix I designed, with my childrens names on the wings.. we rose from the ashes.. we live. So happy for you, Mir. And for your daughter – what a journey – a true survivor. Ohhh, this gave me chills. Thank you for sharing and much love to you and yours. Ohhhh. No wonder the pain was bad, you got the tattoo on one of the more sensitive parts of skin. It’s very pretty! And symbolic and appropriate. The main problem with tattoos is that you outgrow them, you move on from who you were in that part of your life. The one you chose is something you don’t want to outgrow, something that stays with you as a positive memento. I like this. Love them! And this comment coming from one who really doesn’t like tattoos! What Aska said! Those are tattoos that will continue to be perfect for your entire lives. I’ve been following along for the past few years…. Witnessing the struggles of your family. Quietly praying for all of you and processing my own teenage years – similar to Chickadee’s. Feeling grateful for being here (at 40-mumble-something), and guilty for how much stress I caused my family. I’m thrilled to see 2 wrists in your photo. Thrilled to see your beautiful tattoos. Thrilled to wish Chickadee a happy 18th birthday. From someone who’s been there – hang in there. It’s so worth it! It’s not always easy, but it’s good. Very nice work, Mir. I really like how her semicolon is like a cutout from your tattoo. Congrats! I’m also not a big fan of tattoos, but yours are just perfect. So meaningful and beautiful. What a powerful way to celebrate your survivorship. “I cannot describe what it’s like to live with that fear to someone who hasn’t experienced it. It’s debilitating” This sentence really got to me. Such a good description of the effects of fearing for your child’s life. The fear may fade but it never goes away. I adore that yours is messy. And I love that each has meaning. This damn ladybug tattoo (that you can’t even tell is a ladybug) on my back makes no sense. Oh, sniff! That is some beautiful artwork! Happy birthday Chickie and happy mom-day Mir! Tattoos are NMS but this is perfect and should I ever be in a similar situation to you (my kidlets haven’t even made it to kinder yet!) I think this is a perfect thing to do! Never thought I’d cry at a tattoo or two. I love them, the symbolism and the story behind them. Apparently the artist is fluent in hand waving. Congrats Chickie on being 18! Thanks for sticking with us, and wishing you and your daughters the strength and grace to come through your own family’s challenges. It’s amazing what we can withstand.